This Christmas is a bit different for us as it is the first Christmas that Freddie has been totally dairy and soya free. So buying traditional chocolate coins and selection boxes has been quite hard! The first thing we have brought for Freddie is a Moo Free Advent Calendar. Moo Free Chocolate is both Dairy and Soya free so this is perfect for Freddie so he is not left out when James has a chocolate calendar to open. Moo Free chocolate is made in a factory that does NOT manufacture milk chocolate or any other milk, gluten or soya based products. For me this is fantastic as it means Freddie can enjoy chocolate treats over Christmas like James and he won't get a poorly tummy. 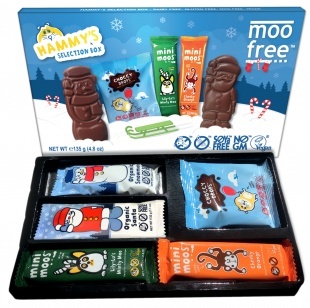 The next thing we have bought is also by Moo Free and it's a selection box. James always gets a chocolate selection box for christmas. So when I found a Moo Free one in our local Aldi I was thrilled that Freddie will not be left out this year! We have also bought him some Moo Free mini chocolate Santas which you can also find in the selection box. You can find Moo Free Chocolate in Asda, Holland and Barrett, Sainsburys, Waitrose and many other independent shops around the country!